RBTH presents a selection of views from leading Russian media on international events, featuring a report on Kiev’s reaction to proposals of broad autonomy by the rebel “republics” in southeast Ukraine, news of deterioration in relations between the Gulf states and the U.S. over the Iran nuclear deal, as well as further analysis of U.S. Secretary of State John Kerry's visit to Russia. 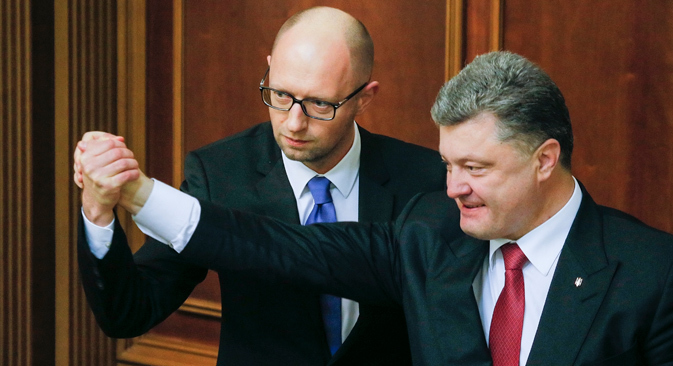 The Nezavisimaya Gazeta centrist newspaper reports that Ukrainian President Petro Poroshenko will make a two-day visit to Germany on May 13, while Prime Minister Arseniy Yatsenyuk will go to France. Earlier it had been supposed that the Ukrainian leaders would try – on the eve of the EU Summit in Riga on May 21-22 – to convince their European partners about the necessity of sending an international peacekeeping mission to the Donbass region of eastern Ukraine. Now Poroshenko and Yatsenyuk are faced with a more difficult challenge: explaining to Europe why Kiev cannot accept the proposals made by representatives of the unrecognized Donetsk and Lugansk “people’s republics” (DNR and LNR) on "very broad autonomy" for the entities within Ukraine. Ukrainian experts believe that the announcements made by the DNR and LNRare unrealizable and resemble an ultimatum. They do not exclude that the proclamations of the self-proclaimed republics of their readiness to accept broad autonomy within Ukraine is a ploy. Ukrainian political analyst Serhiy Taran believes that the DNR and LNRproposals are not an initiative for peaceful regulation but a screen concealing the aim of carrying out a continuous destabilization of Ukraine. Taran told Nezavisimaya Gazeta that, according to the Ukrainian side, crossfire has not ended in the Donbass, people are continuing to die and the volume of military hardware in the region is increasing. “The West must understand that this will not end until Ukraine strengthens its security system and Russia weakens economically,” said Taran. Experts in Kiev believe that the Europeans’ position on the issue is vague since their economic interests are suffering due to the anti-Russian sanctions, writes Nezavisimaya Gazeta. The Vedomosti business daily reports on the May 12 talks between U.S. Secretary of State John Kerry, Russian President Vladimir Putin and Russian Foreign Minister Sergei Lavrov. The newspaper writes that during their discussion the sides agreed that there is no alternative to the political regulation of the Ukrainian conflict, while the Russian side insisted on the necessity of direct dialogue between Kiev, Lugansk and Donetsk and the implementation of full-fledged constitutional reform in Ukraine. Vedomosti cites Vasily Kashin, an expert from the Center of Strategy and Technology Analysis in Moscow, as saying that the rapprochement between Russia and China should not be considered the reason for Kerry's visit. Most Americans are still skeptical about this issue. Kashin believes that the visit is most likely related to the necessity of discussing the situation in the conflict regions in the Middle East and the dynamics of regulating the Ukrainian peace settlement. "Kerry's visit does not imply that the U.S. has changed its position towards Russia, but Washington never intended to break off relations with Russia completely," said political analyst Nikolai Zlobin. U.S. President Barack Obama does not want to be blamed for refusing to engage in new attempts to influence the Kremlin and he needs new arguments in his discussions with the Europeans on the issue of sanctions. The daily business newspaper Kommersant writes that, having lost hope of undermining the upcoming nuclear deal with Iran, Saudi Arabia’s King Salman has refused to participate in the May 13-14 summit with the U.S. and the Cooperation Council for the Arab States of the Gulf, which was intended to smooth over the contradictions between the allies. Riyadh and its closest allies had been waiting for guarantees, preferably in writing, that the U.S., considering the upcoming agreement on Tehran’s nuclear program, would be ready to defend it in the event of an attack from Iran, explains the newspaper. However, Washington has made it clear that there can be no talk of any legally obliging agreement in the field of security. King Hamad of Bahrain and the monarchs of Oman and the UAE have joined the Saudi leader's demarche. "Relations between the U.S. and the Sunni monarchies of the Persian Gulf have radically changed," says Theodore Karasik, a Middle East expert from the Risk Insurance Management Foundation. "Washington had wanted more independence on security issues from its allies for a long time. This yielded results: The countries developed unprecedented military activity in the Middle East and North Africa, yet for Washington the effect of their increased independence turned out to be negative." According to Middle East scholar Alexander Shishkin, in the current situation the Sunni monarchs will try to squeeze everything possible out of Washington. Experts believe that one of the main items on the agenda at the talks could be oil prices, which Riyadh has kept low lately, helping Washington put pressure on Moscow, writes the newspaper.